Could some of the hardiest bacteria on Earth hitchhike on a Journey to Mars and survive after landing in a new world? NASA researchers intend to find out. A helium-filled scientific balloon will soon carry bacteria to the edge of space—Earth's stratosphere—exposing them to conditions similar to those found on the surface of Mars. NASA researchers will measure how long the bacteria can endure up there, and they also will study the biological underpinnings of bacterial survival in harsh conditions. Earth's stratosphere is an extreme environment. Situated above 99 percent of Earth's protective atmosphere, conditions are dry, cold, and bathed with intense ultraviolet solar radiation. The air pressure is so low it's nearly a vacuum. For these reasons, Earth's stratosphere is a great stand-in for the surface of Mars. "If we want to discover life on other planets we need to know if we are introducing Earth life as we explore," said David J. Smith, scientist in the Space Biosciences Division at NASA's Ames Research Center, Moffett Field, California, and principal investigator for the study. "There are terrestrial microorganisms that can survive space-like conditions. We know some of these same microorganisms are onboard robotic spacecraft so we need to be able to predict what will happen when they get to Mars." "B-Line to Space: The Scientific Ballooning Story." A specialized hardware system that will be used for the study, Exposing Microorganisms in the Stratosphere (E-MIST), was developed at NASA's Kennedy Space Center in Florida. The E-MIST system was successfully flight tested during a five hour balloon flight in 2014. A report on the test flight was published in the December 2014 issue of Gravitational And Space Research. Following this successful validation of the E-MIST system, the first full science mission using the E-MIST system is planned to launch from NASA's Columbia Scientific Balloon Facility in Fort Sumner, New Mexico on September 26. During this mission, similar to the 2014 test flight, the balloon will ascend to altitudes upward of 120,000 feet. "This weekend's flight will be a long duration float in the stratosphere" said Smith. With the extended mission time, the researchers expect to expose the bacteria to the Mars analog environmental conditions for separate intervals of six, 12, 18 and 24 hours. "I suspect the bacteria will survive, but we just don't know until we fly them up there and take a look afterwards in our lab," said Smith. Before launch, NASA researchers will load bacteria samples into specialized containers that can be opened or closed during flight by the E-MIST system. Launching with closed containers will protect the bacteria from the elements during ascent to Earth's stratosphere. Once the balloon reaches a target altitude, the containers that hold the samples of bacteria will open. At a series of specified time points, each container will close. To terminate the flight, an explosive charge will detonate, tearing a hole in the balloon. E-MIST and other science payloads attached to the balloon's gondola will return to Earth under a parachute, where waiting researchers will recover biological samples for analysis. The E-MIST hardware system was built with funding from Rocket University, a training program developed by Kennedy's Engineering and Technology Directorate and supported by the NASA Office of the Chief Engineer. The E-MIST 2015 science mission is supported by the Core Technical Capabilities Special Studies project at NASA's Kennedy Space Center in Florida; the NASA Balloon Program Office at NASA's Wallops Flight Facility, Wallops Island, Va.; and NASA's Space Biology Project at Ames. Balloon launches are sensitive to local weather conditions and the launch time may vary. Whatever the exact time the balloon takes flight, "l'll be watching online from my office, and so can anyone else with a computer," said Smith. 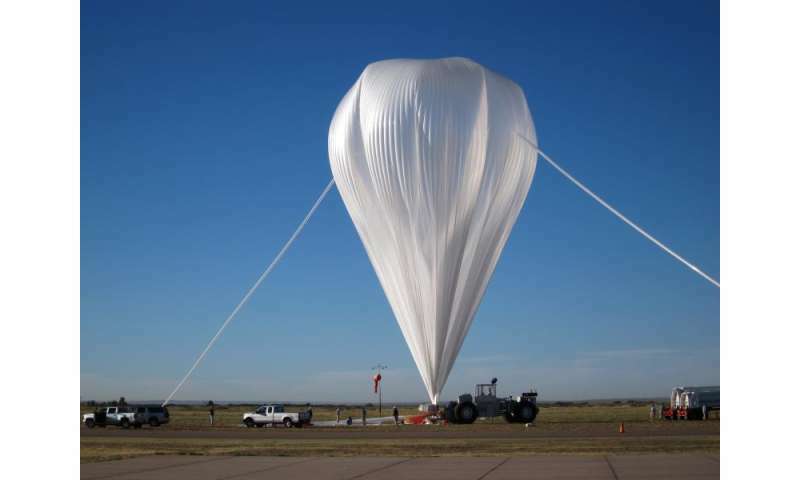 During the experiment the public can watch the progress of the flight unfold by following the links to Fort Sumner Operations from NASA's Columbia Scientific Balloon Facility website at: http://towerfts.csbf.nasa.gov/.